Recurrent flooding along the Shabelle River in Southern Somalia has been one of the key challenges for agencies involved in community development in the area. The Shabelle River is worst affected owing to the topography of the area, uncontrolled irrigation activities and poor river basin management following the collapse of pre-war flood control infrastructure. The Gu 2018 rainy season which was characterised by heavy rains inside Somalia and the Ethiopian highlands led to a significant increase of river levels subsequently leading to river flooding that caused agricultural and economic damage in the Shabelle river basin. SWALIM, has been involved in analysing and mapping the river breakages along the Shabelle River using very high resolution (sub meter) satellite imagery and a Digital Elevation Model (DEM) derived from earlier acquired aerial photographs having 3 meter resolution. 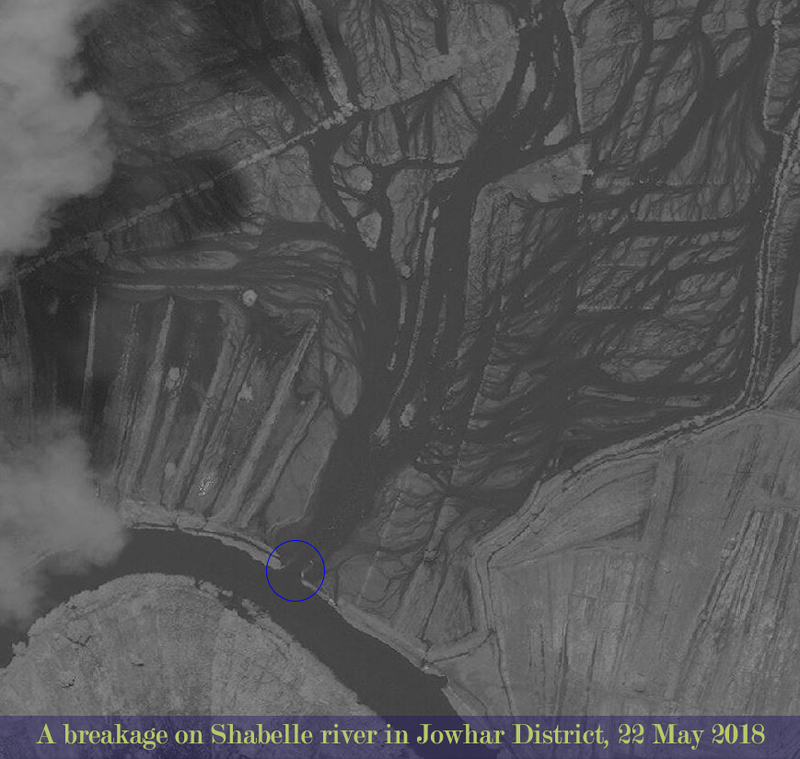 Four types of breakages have been identified along Shabelle River namely; Open, Overflow, Potential and Closed. The open breakages are those that were still open according to the latest satellite image analysed and indicated in the attached table. The Overflow, indicates points where there has been recent river spillage causing extensive flooding. The Potential breakages represent points that have very weak river embankments or have experienced several breakages/overflows in the past. The closed breakages are those that were previously open but efforts have been made to close them either with sand bags or heavy machinery. A legend/Key is attached herein for further explanation of the different types of breakages. 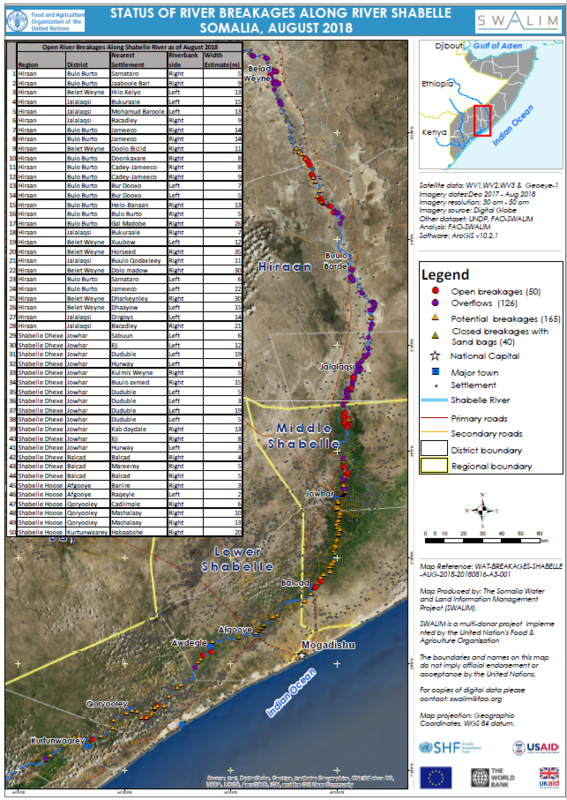 The attached table provides locations of both Open and Overflow points along the Shabelle River which require immediate attention. A total of 50 Open points have been identified which is 100% increase from the previous assessment carried out in March 2018. The Gu 2018 heavy rains led to increased river levels and subsequent additional river breakages. 126 Overflow (Overbank river spillage) points have also been identified. The estimated cumulative length of the Overflow sections along the river bank is approximately 82.6 km whose calculation is derived from visible spillages and fresh sand deposits during the flooding period. Several other points, which are either potential or temporarily closed with sandbags, have also been identified. With the Deyr rains expected in October and November 2018, river levels will increase with a likelihood of flooding especially where open and overflow points have been identified. There is therefore an immediate need to close the open points and reinforce areas where there are weak river embankments. Maps of the status of river breakages, with detailed information, have been produced at large scale and hardcopies can be obtained from SWALIM offices. It is worth noting that the methodology is biased towards Remote Sensing (RS) interpretation with only limited “ground truthing” due to access constraints. Open breakages and overflows might have been omitted in some cases where satellite images were not available or may not have been very clear due to heavy cloud cover.